My experience with teaching children over the past 29 years has afforded me the opportunity to see the importance of building motor and sensory skills first hand. I am passionate about helping those who teach, understand how children learn and giving them the resources to help children move beyond their stumbling blocks. Did you know that learning and memory are heavily influenced by our ability to interpret sensory information from our environment, understand our body’s movements and sense our body in space? Brain connections are influenced and strengthened through movement and sensory stimulation. Dr. Carla Hannaford asserts, in her book Smart Moves, that movement integrates and anchors new information and experience into our neural networks. As we move our muscles, we build skills for learning. Over the years, curricula placed less emphasis on incorporating the fine and gross motor activities that build skills, including handwriting instruction. Handwriting has taken a back seat to computers. What a mistake! There is no substitute for learning proper letterform and having fluency in writing. Research supports that learning to handwrite properly and using the handwritten word strengthens brain connections as well as thinking. In today’s society, we see an increasing number of children who struggle with learning; more diagnosed with learning disabilities and more whoexhibit ADHD behaviors. Though the Center for Disease Control reports 7-9% of school-aged children have a true diagnosis, ADHD is over- reported. Much of the perceived ADHD behavior is really a motor skill problem. It seems so fitting that we address how to apply motor skill activities in our instruction. Not only will it help train the brain, it will make learning easier and more fun! Fun learning makes interested students with increased attention and retention. Early learning starts with motion. It does not take place by staring at a T.V. or computer screen and watching “objects go by”. Through the movement of our bodies, particularly as infants and young children, we send vital information to our brains helping them organize and respond to the world around us. Messages taken in through touch (pressure), motion, sight and sound are called sensory information. The more sensory experiences we provide our children the stronger and more organized the brain becomes. Amazingly, sensory information, interpreted correctly in the brain, helps us to organize, learn and respond appropriately! Jean Ayers, an occupational therapist and pioneer in the area of sensory integration determined that one of the most critical times for developing sensorimotor skills is between 3-7 years of age. Movement activities include large muscle (gross motor), small muscle (fine motor), writing and speaking. Ingersoll and Goldstein’s research found that memory is also improved by using motor movements, auditory and visual stimulation during the learning process. Activities and lessons that incorporate some movement and different sensory forms give the student the best opportunity to build stronger neural connections and to learn. Brain engaging strategies, direct teaching and guided practice assist students’ progress toward improvement and successful completion of schoolwork. A multi-sensory approach to learning is particularly helpful for students in kindergarten through sixth grade and those with Attention Deficit Hyperactivity Disorder or learning disabilities. The integration of motor activities into the classroom and home environment can be a tremendous help in reading, writing, attention, and memory. Students who learn to develop specific motor movements can incorporate such skills into successful participation in learning. At EduCLIME, LLC, we understand this approach. 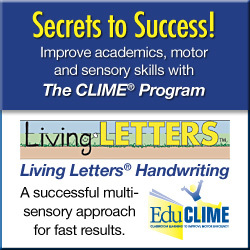 The CLIME® (Classroom Learning to Improve Motor Efficiency) Program was designed to be a resource to assist in providing activities across critical motor skill areas. The program provides the instructor with some background knowledge and a variety of activities to help the student improve. The Living Letters® Handwriting incorporates color, multi-sensory activities and a memorable story to engage the brain. Through fun practice and repetition, children quickly learn proper letter formation and the ease of writing. For more information, visit www.educlime.com.